As you will see, this isn’t about making jodhpurs. It’s so named because I bought a load of fabric, mainly in Jodhpur, Rajasthan, India, and this is my first make with any of that fabric. The inspirations are many-fold. 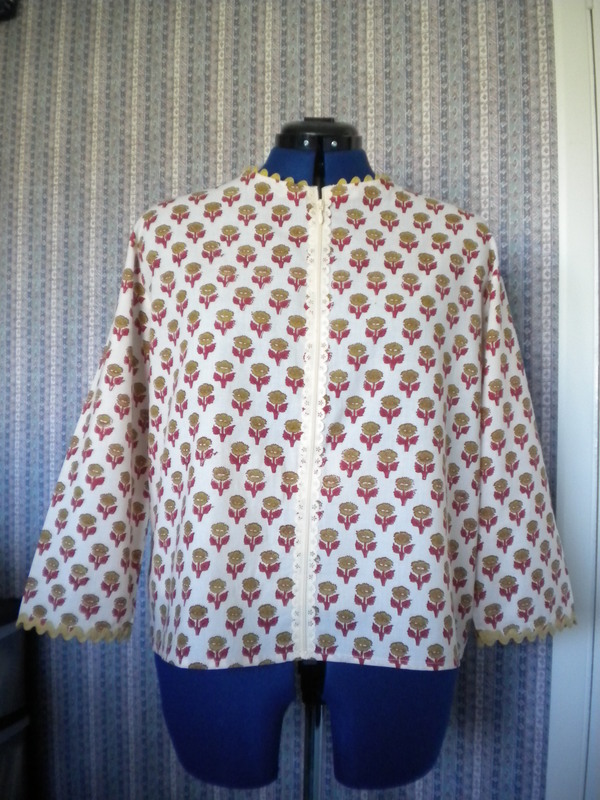 I think it started with a quite simple jacket that I saw in Cos, and realised that I could turn a basic blouse into a jacket by putting a zip down the front, with slightly adjusted cutting arrangements. Making a feature of the zip seemed like a good idea and is much ‘on trend’, as they say. The ric rac decoration was inspired by a Picasso dress at the Museum of Fashion and Textiles. Put is all together and this is what you get. As usual, there were several challenges. I tackled the revised cutting arrangements successfully. The pattern fastening is at the back, but I have cut the back on the fold, and added a seam allowance to the front. I also adapted the sleeves to 3/4 length, and am pleased with the results. I had enough material for a longer blouse with short sleeves, or a short blouse with 3/4 sleeves. The latter will go with more and be more widely wearable. You may have noticed a problem which I presume will apply to the whole range. It’s all well and good buying authentic Indian block printed fabric (probably commercially printed), but there is no guarantee that the pattern will be aligned to the grain. I measure the grain to be mm perfect, subject to some minor movement as I pin the pattern in place, but the fabric design has a life of its own, and is not mm perfect. 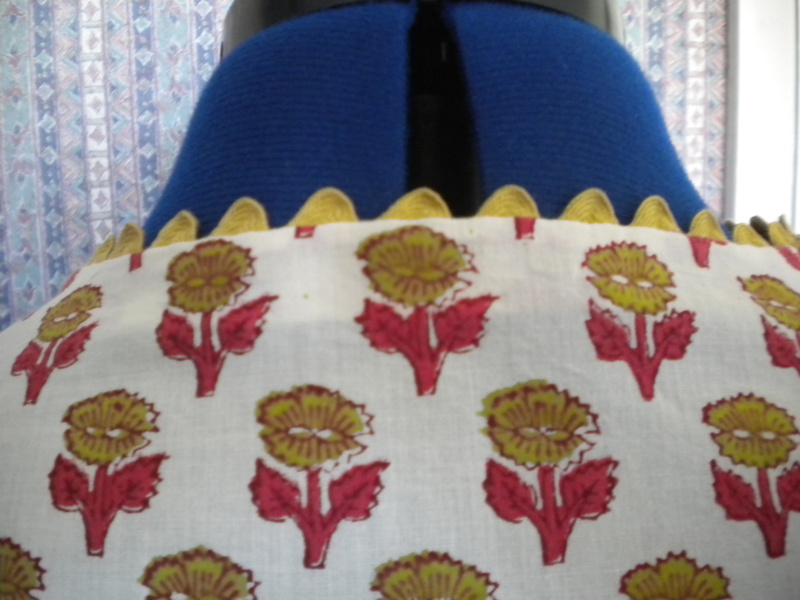 It generally starts off aligned at the top of the blouse, and then wonders off towards the bottom. ‘A feature’. I will have to live with it. This is my first attempt at using a zip stitched on top of the fabric, and it came off a roll. Tack first. I knew that part! I also got the finishing of the zip at the bottom correct, and initially stitched across the top of the zip to stop the fastener coming off. So far so good. I had some concerns that I would end up with a lot of bulk at the centre front neck, so using tacking, and trial and error, I managed to arrange everything to limit the bulk. And as part of this process I cut off the part of the zip top that I had stitched. And the fastener came off. Amazingly I manage do get it back on again first time, but a second time and I was struggling. So fearing that I might need to replace the whole zip, I dashed off to ‘Guthrie and Ghani’, where I had bought both the zip and ric rac, and Lauren saved the day by showing me what to do….. It’s difficult to get it back on from the top, but by un-doing the bottom finish of the zip, it will go back on again from the bottom. So it’s quite lucky that it was merely tacked in place at the time. I came home with sellotape all over the zip ends, and immediately stitched the stoppers back in place. A lesson learnt and advice to anyone who reads this who has not previously dealt with zips from a roll. I also spent some time working out the best way to incorporate the ric rac into the neck line. It was tacked to the blouse front, and then sandwiched between the front and the facing. I then stitched along the tacking line in order to be sure that i had the right amount poking out of the top. This is also the first time that I have under-stitched a facing. So neat! Why did they not teach me that in school, or indeed, at home, which is where the real skill comes from!? And then the sleeves. Should the ric rac be on the front, or poking out, like the neck line? The colour match is so good, that I have put it on top. I hand stitched the top of the ric rac in place, and then ran a line of machine stitching close to the edge to secure it in place. I hope that will suffice. It frays, and is not easy to get the needle through. It is gold, dotted with pin-pricks of blood in places! And now it’s finished, and has given me much pleasure from the process of ‘designing’ it and working out how to make it. How to make a simple pattern slightly complicated! This entry was posted on April 16, 2014 by ann hebden in Fashion, Sewing, Tops and tagged Fashion. Sewing, Tops.